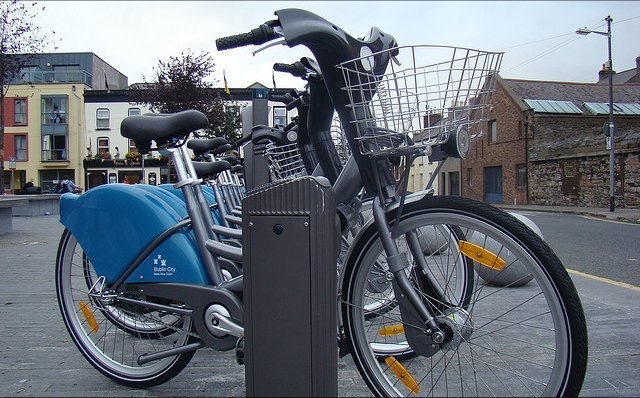 A launch of Dublin’s first stationless bike share system planned this weekend could be stalled due to a threat from Dublin City Council to remove its bicycles from the city’s streets. Bleeperbike had planned to launch its system of 1,000 bicycles on Sunday, with a price of €5 for 5 rentals up to 1 hour each. However, Hugh Cooney, CEO of Bleeperbike, told IrishCycle.com this evening that he is re-evaluating the launch date and will make a decision tomorrow if it will go ahead as planned. Cooney was looking to announce the launch on the Bobby Kerr show after 10am on Newstalk, but he now fears the city will now “make an example” of his company. He said Bleeperbike had released 25 bicycles already as part of a soft launch and that this was done earlier today before he had seen the warning from the city council. The Bleeperbike app is live and the limited number of bikes currently out are usable. The launch price for Bleeperbike is €5 for 5 rentals and €25 for 27 rentals, with rentals up to 1 hour each. They intend to add an option of €5 for a day pass and €75 for 12 month membership, which includes two 1 hour rentals per day. The company outlines on its website and app that bicycles should only be locked at public bicycle parking stands, racks and Cyclehoops. Cooney said that Bleeperbike would be willing to contribute towards the cost of expanding bicycle parking in the city. Cooney lived in China and on a visit back there the stationless forth-generation bicycle share systems grabbed his attention. Since then he said he has worked on the launch for 9 months none stop. He said that he first contacted the city council 6 months ago and told them of the launch date weeks ago. So, he questioned why the council is only now saying that Dubliners should wait longer for an expanded bicycle share offering. IMAGE: Unlike DublinBikes (pictured on its launch day) the new generation of bicycle share does not have docking stations and instead use smartphone apps to unlock the bikes. The city council said that the launch was “premature pending the preparation of bye-laws” and that it bypasses “full engagement” with the council and “may secure an unfair advantage over other potential operators who are prepared to work closely with Dublin City Council.” It said that the bye-laws will likely require operators to apply for a licence to operate within the city. IrishCycle.com understands that Bleeperbike is one of four or more companies looking to operate stationless bike share in Dublin and there are a mix of Irish and international companies involved. The council said in a recent report that it “has been approached by several potential operators”. Bleeperbike is based on the same bicycles and technology as Yobike, which launched in Bristol in April. YoBike are also investors in Bleeperbike, Cooney confirmed. Meanwhile, the Chinese firm Mobike is due to launch in Manchester later this month as a way to “kick off” its Europe-wide expansion. The company has 10 million users in China, and news agency Reuters reported today that its financing rounds since October has topped $900 million. It’s European expansion plan is described as aggressive, although, it is not yet confirmed if Mobike has detailed plans for Dublin. The stationless bicycle share crazy in China recently hit the headlines due to bicycles being abandoned on mass outside apartments, but Cooney said that Bleeperbike is focused on avoiding such issues by suspending accounts which do not use public bicycle parking stands and racks. Cooney said that the company’s launch date and its focus on clamping down on poorly parked bicycles was outlined to Dublin City Council weeks ago, so, he was surprised by the council’s warning today. In regards to bicycles abandoned around the city, he said that he’s “a citizen of this city too and mainly a pedestrian”, so, would not want to see streets clogged with poorly parked bicycles. He said that the company is employing “zone supervisors” who will track down poorly parked or abandoned bicycles. They will have one employee patrolling per ever 250 bicycles they have on the streets. As we reported yesterday, there will also be a scoring system. Each user starts with 100 points and gains one point for each ride, for reporting a broken bike, reporting a incorrectly parked bicycle, and inviting a friend to use the system. Users with higher points will receive free rides. On the other hand, users will lose 20 points if the bicycle they rent is found to be parked in a private area and they lose 50 points for “abandoning the bike”, which might included any incorrect parking. Users are reduced to a score of zero if they use a private lock or forgot to lock the bike. Accounts which go under 100 points will be suspended pending review. MAIN IMAGE: Thanks to Shane Hogan. This seems to be just until the bye laws are in place. I can understand this stance completely and understand where DCC are coming from. I think we just need to be more patient. However, I fear with regulation of this industry it could lead to less competition and higher prices for consumers. How long will the by-laws take? The number of bike parking places in Dublin is not up to standard – they’re a nod to the notion that people ride bicycles. And Dublin Bikes aren’t working well; it’s common to see entire stations without one bicycle available for hire. They’ve served the city well, but this new model could be much better (though it may not provide an income stream for the council). Dublin City Council should a) get into action to provide parking in the city and suburbs, and b) support any company that offers a cheap hiring system for bikes, which is essentially what this is. Typical state monopoly attitude. It’s my lunch and I’m not sharing with anyone else. This proposed system is no different than using a private bike and DCC have been glacial in their accommodation of biking in Dublin. They should go to Amsterdam, Delft, etc and see how it is done properly! Why can’t they allow it and just regulate it so it doesn’t get out of control as it has in China? Allow 4-5 licensed sellers to keep prices low with limited bicycle units allowed per license. The price as it stands isn’t even particularly affordable to students, but may be attractive to tourists. A new bike from a dublin bike shop http://www.bikesorbicycles.com sets you back €175 and this seems to cost €75 per year with a limit of 2 rides per down? Price isn’t going to revolutionise commuting so seems to me it’ll moreso hurt Dublin bikes than anything, hence the objection.